The mutant population is dwindling in the dark and dreary world of Logan, the third and final Wolverine solo film starring Hugh Jackman. 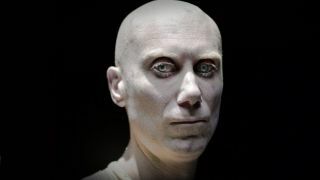 But "dwindling" doesn't mean "gone," and today we get a good look at one of the fellow muties ol' Claws will encounter during his adventure: Caliban, played by Stephen Merchant. Caliban's mutation allows him to sense and locate other mutants, much like Professor X's Cerebro (though Caliban is not as powerful as that machine). It's interesting that Logan's plot will incorporate this albino mutant, as he's never been a particularly large part of Wolverine's life in the comics - in fact more often than not, when he does shows up, he's a villain under the influence of Apocalypse. Plus, Caliban already showed up in X-Men: Apocalypse, played by Tómas Lemarquis. As Deadpool would say, "These timelines are so confusing." As for the actor behind the makeup, Merchant was co-creator and writer of TV series The Office, and voiced Wheatley in Portal 2. He's quite the tall and lanky fellow, measuring in at 6'7" tall - more than a full foot taller than Wolverine's height in the comics, a mere 5'3". Considering all of this, I'm expecting a "comedy relief" role. In any case, with Professor X losing control of his mind and powers, Logan could probably benefit from someone like Caliban if he were searching for someone - for instance, a certain young mutant girl cloned from his DNA?